I live and work in Makati but I rarely see and observe the Makati lunch crowd. I work nights and night time lunch is different from day time lunch. You see - working nights mean you can dress down. So most of the people you see during your lunch time at midnight are wearing jeans, t-shirts, and sneakers. Makati daytime - is very different. Most companies still retain the dress code prior to the dot com era. I used to work for a consulting company and their dress code prescribed hosiery for women, under-shirts for men, closed toe pumps for women, and neck-tie for men. Most local banks still follow that dress code. Today - I woke up early but I knew that I didn't have to work tonight since it's Martin Luther King in the US. It's sort of a holiday for the US - and it's actually observed by the company I work for. 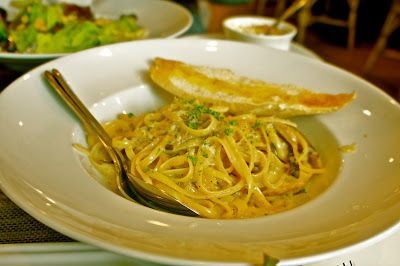 I decided to go out for lunch and I didn't want to go that far - so I had my lunch at Relish at Ponte Salcedo. I was wearing shorts since the restaurant was in my building. I was the only one dressed down since it's the daytime lunch crowd. Incidentally - the only non-working group in the restaurant was a group of women who look like the grand Dames of Manila. 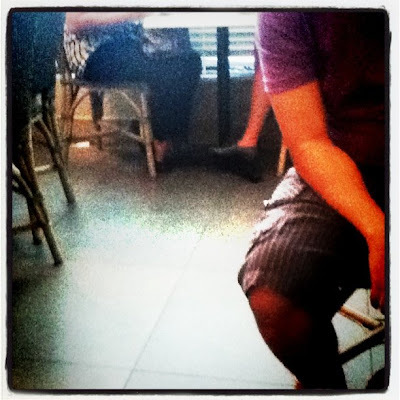 Although they do not work - their outfit still meet the strict dress code of Corporate Manila. I was actually tempted to call them the real housewives of Salcedo Village - but I recall that maybe half of these supposed housewives may actually be mistresses. So I ate my lunch - fidgeting most of the time - feeling uncomfortable over the fact that I was so under dressed. I was tempted to ask my lunch company ( who was actually dressed up as well ) - to just have our lunch to go. Thing is --- as I said earlier - this is a rare occasion for me - to eat lunch when the sun is out --- so I decided to stick it out even if it meant sticking out like a sore thumb. But enough about my under-dressed drama - and let's talk about what I had for lunch. 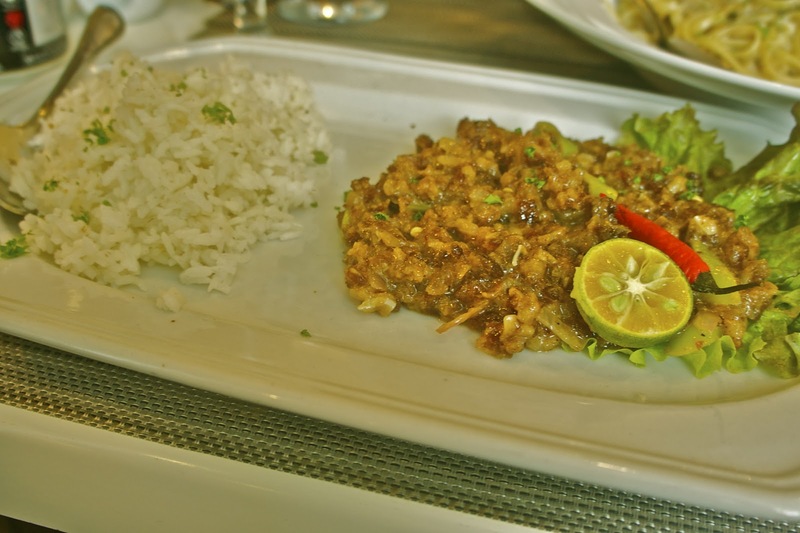 I ordered the Relish sisig. It's new in their menu. I told the waiter that if it's not crispy - I will send it back to the chef. It was not crispy - but I didn't send it back. It was delicious. Relish really does not disappoint when it comes to their dishes. My friend ordered their cream based pasta - and I can't recall what it's called. I can only remember that it's cream based with mushroom and truffle oil. The chef seems to have mixed a lot of truffle oil in the sauce. It was again scrumptious but it tasted so rich. I am writing this blog in the evening - trying to keep myself awake. Tomorrow - I'm back to working nights. So I have to make sure that I keep to the right schedule. Tomorrow - I go back to having lunch with the underlings who wear jeans, t-shirts and sneakers.